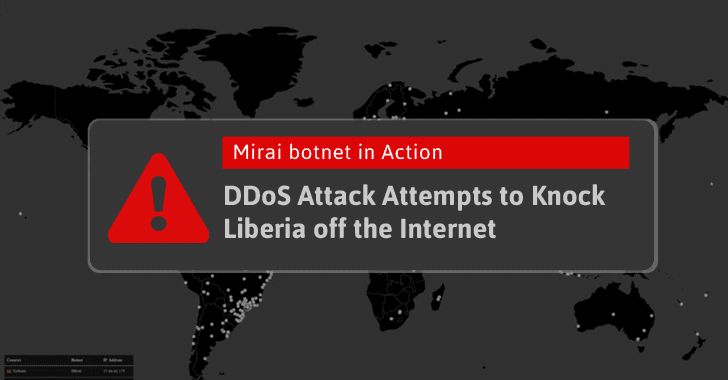 Note — We have published an updated article on what really happened behind the alleged DDoS attack against Liberia using Mirai botnet. Someone is trying to take down the whole Internet of a country, and partially succeeded, by launching massive distributed denial-of-service (DDoS) attacks using a botnet of insecure IoT devices infected by the Mirai malware. It all started early October when a cyber criminal publicly released the source code of Mirai – a piece of nasty IoT malware designed to scan for insecure IoT devices and enslaves them into a botnet network, which is then used to launch DDoS attacks. Security researcher Kevin Beaumont has noticed that Botnet 14 has begun launching DDoS attacks against the networks of "Lonestar Cell MTN ", the telecommunication company which provides the Internet to 10-15% of Liberia via a single entry point from undersea fiber cable. "From monitoring, we can see websites hosted in country going offline during the attacks — Additionally, a source in country at a Telco has confirmed to a journalist they are seeing intermittent internet connectivity, at times which directly match the attack," Beaumont said in a blog post published today. According to Beaumont, transit providers confirm that the attacks were over 500 Gbps in size, but last for a short period. This volume of traffic indicates that the "Shadows Kill" Botnet, as the researcher called it, is "owned by the actor which attacked Dyn." In our previous article, we provided some basic, rather effective, solutions, which would help you protect your smart devices from becoming part of the Mirai botnet. You can also check also yourself if your IoT device is vulnerable to Mirai malware. Head on to this article.